Truth Surfer: Ember - The Right Wing Christian Extremist? I received a letter today from Art Higinbotham, an Ember Reichgott Junge supporter, in which there are several fairly nasty comments about everyone in the race, except Ember of course. 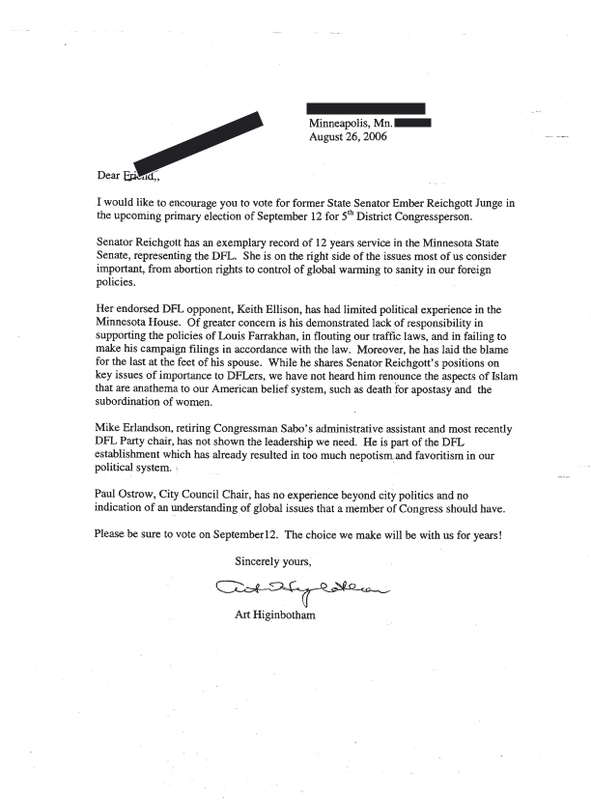 Her endorsed DFL opponent, Keith Ellison, has had limited political experience in the Minnesota House… While he shares Senator Reichgott’s positions on key issues of importance to DFLers, we have not heard him renounce the aspects of Islam that are anathema to our American belief system, such as death for apostasy and the subordination of women. Okay, should we try to point out the same kinda whacked out crazy beliefs Christianity has within it and hold all practitioners of that religion accountable to everything too? Do we really want to go there? While she shares Representative Ellison’s positions on key issues of importance to DFLers, we have not heard her renounce those aspects of Christianity that are anathema to our American belief system, such as calling for the death of all homosexuals or limiting free speech for women. I could go on, and on (do I really have to link to all the slavery stuff?!? ), but that is not the point. The point is that this type of false judgment of making one individual stand for the whole race/religion/culture, and demanding that person distance himself from some marginal aspect of it is plain ridiculous and down right religious bigotry. No one paints all Christians as wanting all homosexuals executed, or desiring to strip women of their civil liberties, nor should anyone try to force individuals who practice Islam into a similar box. This type of religious ignorance is plain shocking coming from a Unitarian, and just one more reason that we DO need Keith Ellison in the US House. A strong representative of a liberal stance on Islam, for cripes sakes, a PEACE activist Islamic candidate, is desperately needed in our country’s leadership to help educate the country on what a moderate view on Islam can look like, and how we can actually find solutions to the very serious international problems we face today. Ember should distance herself from this type of ignorant hate filled rhetoric, and denounce this person’s views on Islam as the idiocy it is, or she needs to denounce those aspect of Christianity that are anathema to our American belief system. Its her choice. "I grew up reading comic books".